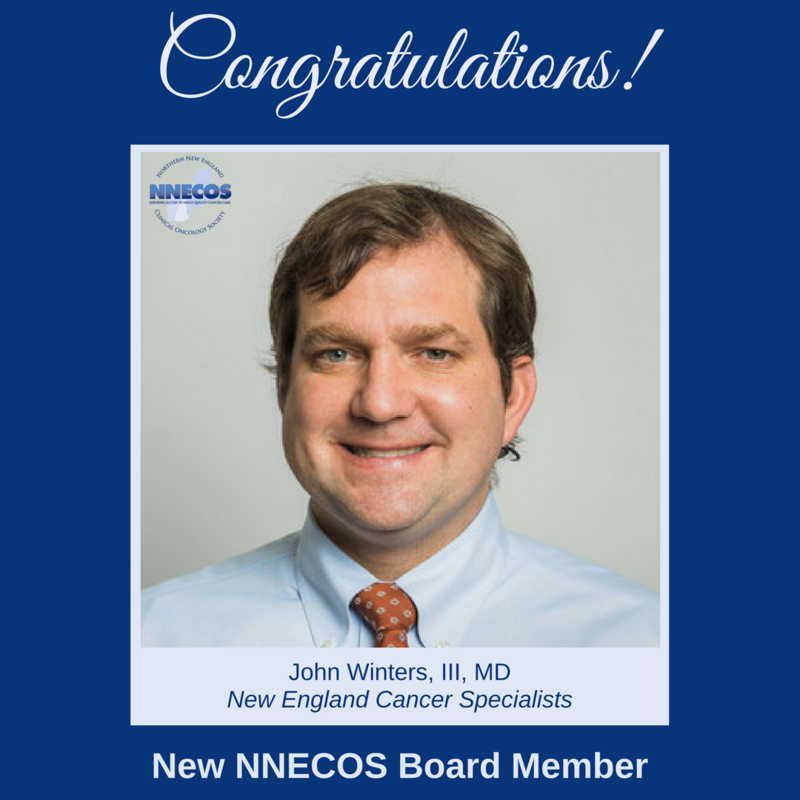 Dr. John Winters is a hematologist / oncologist at New England Cancer Specialists. He was raised in Oklahoma and received his medical degree from the University of Oklahoma-College of Medicine. He trained in internal medicine at the University of New Mexico and stayed an additional year as Chief Resident. He completed fellowship training at the University of Vermont where he and his wife fell in love with the people and landscapes of Northern New England. Having trained under Dr. Steve Grunberg and adhering to tradition at the University of Vermont, he was active in NNECOS throughout his fellowship. He presented new research at the annual meeting all three years of his training, including a podium presentation at the 2013 annual conference. During his final year of fellowship, he attended the NNECOS board meeting as a fellow liaison. After fellowship, Dr. Winters spent a year practicing and pursuing outdoor activities in Bend, Oregon before returning to join New England Cancer Specialists in late 2015. He has remained active in NNECOS and served as an abstract/poster judge at the 2016 and 2017 annual meetings. Dr. Winters is board certified in internal medicine, hematology, and oncology with interests in benign hematology, malignant hematology, and melanoma. He is a member of the American Society of Hematology and American Society of Clinical Oncology. His interest in serving on the board of directors stems from his desire to actively pursue advocacy and joint interests for oncologists and cancer patients on a regional level. Dr. Winters lives in Cape Elizabeth, ME with his wife and their 2 young children. His outside interests include downhill and nordic skiing, snowshoeing, backpacking, running, cooking, and reading fiction.The special election will be conducted via online voting. The election requires a minimum of 10 percent of the voting eligible members to participate to be valid.